Davy and his deaf and dumb younger brother, John Willie, find themselves homeless after their father is killed in a mining accident. Eccentric Miss Peamarsh offers a chance for a new future - but then Davy stumbles across a horrifying secret from Miss Peamarsh's past and it could ruin everything. 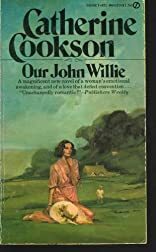 About Catherine Cookson (Author) : Catherine Cookson is a published author of children's books. Some of the published credits of Catherine Cookson include Our Kate, Tilly Trotter, The Moth (Soundings).